The Indian capital, Delhi, has been put on high alert a day after three bombs rocked the city, killing at least 59 people and injuring 210 others. Authorities have urged people to stay indoors, and armed police are guarding key buildings and public areas. A previously unheard of group has claimed the three blasts, but police have yet to point the finger of blame. Prime Minister Manmohan Singh said the attacks were acts of terrorism. Ten people have been detained, reports say. The three apparently co-ordinated blasts came within minutes of each other at dusk on Saturday, when many people were out shopping ahead of the Hindu festival of Diwali and the Muslim Eid celebration. Two of the explosions ripped through crowded markets causing the fatalities, and a third exploded on a bus but killed no one, police say. All major markets in the city have now been ordered to close. Police have raided guest houses and hotels in parts of Delhi as they search for clues as to who might have carried out the attacks. They have also handed out sketches of two men they want to question. One is said to have left a pressure cooker near a gas cylinder at the southern Sarojini Nagar market where most of the casualties occurred. The other was seen getting off a bus leaving a bag behind shortly before the explosion at Govindpuri in the south-east of the city. Home Minister Shivraj Patil said "lots of information" had been gathered, but refused to give details. "Our people are making good progress. The investigation is going well," he told journalists after an emergency cabinet meeting on Sunday. All leave has been cancelled for medical staff as hospitals struggle to deal with the injured. More than 100 people are being treated in hospital, and some of them are in a critical condition. Prime Minister Manmohan Singh has held emergency talks with his top security advisers. On Saturday he blamed "terrorists" for the attacks and said he would not tolerate militant violence. In a brief televised address, he said: "These are dastardly acts of terrorism. We are resolute in our commitment to fighting terrorism in all forms." Security officials said they could not rule out the involvement of Lashkar-e-Toiba, a radical Muslim group fighting for the self-determination of Kashmir. On Sunday, as police sifted through the charred debris for clues, a group calling itself Inqilabi, the Revolutionary Group, telephoned news organisations in Delhi to say it carried out the explosions to further its ends in Kashmir. The BBC's Mike Wooldridge in Delhi says no organisation of this name appears to be known to the police or to experienced observers in Kashmir. He says it is not clear if the claim is authentic or a front for another group. India is home to a huge variety of militant groups, some with very localised campaigns of violence. But Islamists have been able to mount a number of spectacular headline-grabbing attacks in the past. Some observers believe militants might have been trying to scupper improving relations between Pakistan and India, who hours after the attacks decided to open the Kashmir Line of Control to help victims of the recent earthquake. Agreement between the two countries came after Pakistan condemned the explosions, describing them as a "criminal act of terrorism". 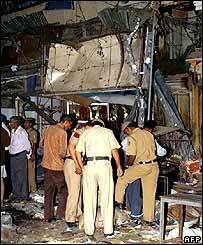 olice said on Sunday that 43 of the 59 people confirmed dead perished in the blast at Sarojini Nagar. 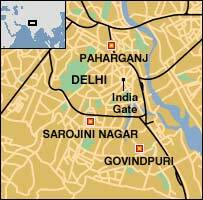 A further 16 died in the first explosion, minutes before, in the crowded central neighbourhood of Paharganj, an area close to Delhi's main railway station and popular with Western backpackers. The third blast, at Govindpuri, killed no one, but the driver of the bus on which the bomb is believed to have been left was seriously injured, reports said. Most of the injured remain in hospital and some are being treated for severe burns. Correspondents say the explosions were intended to cause maximum damage in places frequented by people from all religions.